12 banners which inform about odd-even policy expansion are installed in several locations in East Jakarta, Thursday (8/9). It is done to intensify odd-even policy socialization thus residents become more orderly in traffic.
" Banner installation is done to emphasize the odd-even areas"
East Jakarta Transportation Sub-dept. 's Traffic Section Head, Andreas Eman said, his side have also installed 6 no-entry signs on odd-even routes to warn road users who use different plate numbers from today's dates. "Banner installation is done to emphasize the odd-even areas. Besides, it is also done for Asian Games 2018 succession," he stated. 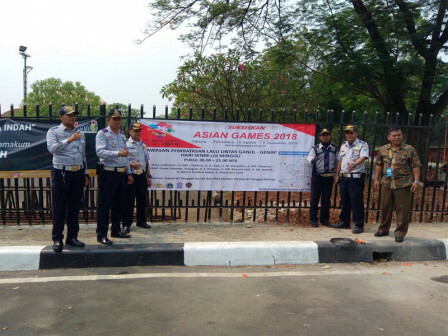 According to him, 12 banners are installed in TMII Toll entrance gate, TMII Gate 1 lane, Cibubur Toll Gate access, Jalan Mayjen Soetoyo UKI, PGC Cililitan Intersection, Rawamangun Terminal. Next is on Jalan Pemuda intersection- Jalan Pramuka, Jalan H. Ten Rawasari intersection, Rawamangun Toll Gate, Prumpung Pedati Toll Gate, Pulomas Toll Gate, and in front of East Jakarta Mayor office.